This automated dairy runs 24/7, so reliability, easy site fault diagnosis, and low power consumption, and being Vermin proof were all top priorities. PJ &PJ Taylor completed this installation of a POLYPHAZ single to three phase rotary converter at Mt Gambier. This had a high specification with regards to three phase and single phase power output voltage, power consumption / losses, and short circuit fault rating. The Polyphaz unit is running very quiet and is much quieter than the small 2.2kW Vacuum pumps that are in the same room as the Polyphaz unit. The Dairy Farmer is very impressed with the unit. The end user gets the benefits of a rotary converter without the downside of power consumption. This is achieved by using the unique floating pole rotaries and maintaining the Power Factor at unity throughout the load spectrum while maintaining a relatively high fault rating of 25 KA. 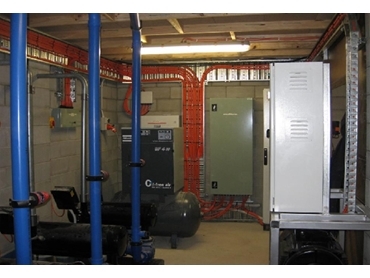 A high short circuit fault rating is important and often overlooked particular in larger installations like this, for example if a fault occurs downstream of the converter and the converter is supplied by say a 100 KVA transformer with a high fault level.